Two new ballets and The Age of Anxiety will be broadcast live across the world as part of the Royal Opera House Cinema Season. 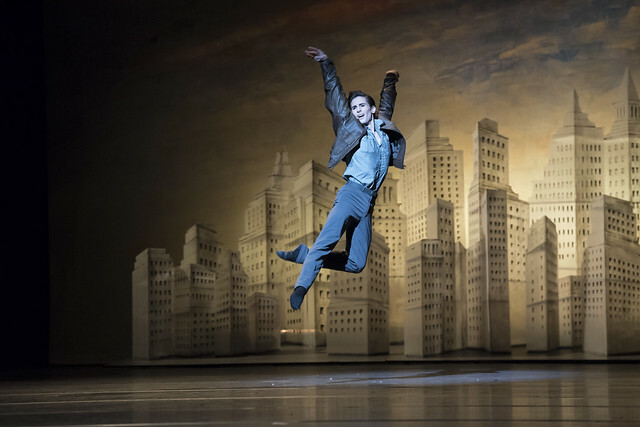 The Royal Ballet's Bernstein Centenary celebrations will be broadcast live in cinemas across the world on 27 March 2018. The performance includes three contrasting ballets, choreographed to music by great American composer composer Leonard Bernstein: Yugen, choreographed by Wayne McGregor, The Age of Anxiety, choreographed by Liam Scarlett, and Corybantic Games, choreographed by Christopher Wheeldon. To enhance your viewing experience, access our Bernstein Centenary digital programme for free using the promo code FREEBERNSTEIN, and enjoy a range of specially selected films, articles, pictures and features to bring you closer to the production. The story of The Age of Anxiety is inspired by the epic poem of the same name by W.H. Auden, which explores the atmosphere of disillusionment and uncertainty that followed World War II. Four New Yorkers meet in a bar: Rosetta, Emble (a sailor) Quant (a businessman) and Malin (an airman). After Emble picks a fight with a GI at the bar, they go back to Rosetta's apartment. In Rosetta's apartment they dance together and look at the New York skyline, various frissons emerging within the group. In the final scene, Malin is alone in front of the Manhattan skyline and dances an ecstatic solo. Bookending The Age of Anxiety are Yugen and Corybantic Games, both non-narrative ballets. Matthew Ball and William Bracewell in Corybantic Games, The Royal Ballet. © ROH, 2018. Photographed by Andrej Uspenski. Leonard Bernstein was one of the first classical composers in America to achieve both popular and critical acclaim. He was eclectic in his sources – drawing on jazz and modernism, the traditions of Jewish music and the Broadway musical – and many of Bernstein’s scores are remarkably well suited to dance. Yugen is set to Bernstein's famous Chichester Psalms, a work for choir and orchestra. The text is sung in Hebrew, and follows the melodic and rhythmic contours of the Hebrew language. The Age of Anxiety is both the name of Scarlett's ballet and the title of Bernstein's Second Symphony, an intense musical response to Auden's poem. Corybantic Games sets Bernstein's Serenade (after Plato's Symposium), a work for solo violin, strings and percussion in five movements. Joining McGregor's creative team are regular collaborator Lucy Carter, who has designed the lighting for all of McGregor's Royal Ballet commissions, and the ceramic artist and writer Edmund de Waal, best known for his captivating book The Hare with Amber Eyes. John Macfarlane, who has collaborated with Scarlett on all his main-stage works for The Royal Ballet, provides designs ‘superb in detail and atmosphere’ (The Guardian) for The Age of Anxiety. For Corybantic Games, Wheeldon has collaborated with award-winning fashion designer Erdem Moralioglu, whose designs are known for their couture-level craftsmanship and use of experimental textiles. Wheeldon explained: 'We went from photos of 1950s underwear, West Side Story, great portraits of Leonard Bernstein strewn all over the floor, down to a very very simple, very clean and very clear design that suggests a contemporary take on ancient Greece, tying in a little bit to the Plato theme of the music, though I decided not to follow the Plato Symposium directly'. Artists of The Royal Ballet in Yugen. © ROH, 2018. Photographed by Andrej Uspenski. The live cinema relay is a showcase for the Company, with a large cast of dancers performing in both Yugen and Corybantic Games. The Age of Anxiety's four main roles will be danced by Sarah Lamb, Alexander Campbell, Bennet Gartside and Tristan Dyer. We've rounded-up audience and press reviews from opening night and we'd love to hear from you before, during intervals and after the live cinema relay, so share your thoughts via Twitter and Instagram using #ROHbernstein. This mixed programme is part of Leonard Bernstein at 100 and Yugen is a co-production with Dutch National Ballet. The mixed programme is staged with generous philanthropic support from The Daniel Katz Gallery, Sarah and Lloyd Dorfman, The Taylor Family Foundation, The Royal Opera House Endowment Fund and the Bernstein Production Syndicate. Yugen is staged with generous philanthropic support from Linda and Philip Harley, Janine Rensch and The ROH Young Philanthropists. Corybantic Games is staged with generous philanthropic support from Kenneth and Susan Green, Mr and Mrs Edward Atkin CBE and Sue Butcher. Many thanks for pulling this material together which I'm sure will help enhance a visit to the cinema. Having been a bit critical of the limited information heralding this Triple Bill, I'm really pleased to have opportunity to look through this page and the programme in advance. I would add just a couple of points. You only list four press reviews and there have been a number of other reviews that could readily be added. A lot of reviews are positive. A link to the Insight programme covering rehearsals of parts the two new ballets could have been included - it really is fascinating to see the choreography being created and shaped in front of the viewer. Finally, a continuing beef I'm afraid, but it would be helpful to have casting information for the remaining performances. Really really annoyed. Thanks to ROH changing its provider in Australia, we no longer have the full season of operas and ballets. No Bernstein centenary triple bill, no Winter's Tale. At all. The cinemas here advertise "10 stunning titles", when in fact the full season is 12. We are being short-changed. Please kindly insist to cinemas for 2018-19 broadcasts that they show ALL offerings. I cannot afford to fly to England every month! I came to the production last night. I was surprised to see you had not given the correct title of Bernstein's music under his name in the programme especially as this was his celebration. ie Yugen - Chichester Psalms, Age of Anxiety - 2nd Symphony, Corybantic Games - Serenade for solo violin and orchestra. Why not?